UPDATE: Dara Tucker’s performance has been postponed until September 2nd. 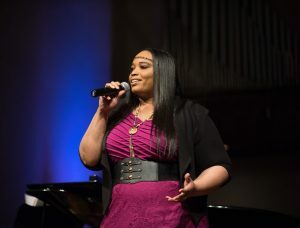 The July 1st Soul Sunday concert will now feature Kristen Trotter – tickets and details here. Hosted by Paisha Thomas, the Soul Sunday series at Natalie’s continues to bring great concerts to the area on the first Sunday of each month, and July’s installment will be no exception. Tulsa-born and Nashville-based vocalist and songwriter Dara Tucker and her band will perform a Soul Sunday concert at Natalie’s on Sunday, September 2nd at 8pm – tickets and more details are available here. Tucker will be joined by her ensemble that features drummer Marcus Finnie (Taj Mahal/Keb Mo Band), keyboardist DeMarco Johnson (Marc Broussard), and bassist Greg Bryant. This is Tucker’s second appearance at Natalie’s, after a strong debut on guitarist Charlie Hunter’s spring tour. Tucker was kind enough to answer my interview questions – Keep reading for more about her album Oklahoma Rain, her work with Hunter, and other insights, along with video. Tell me about your recent release, Oklahoma Rain. Did you have a particular plan in mind when writing the songs and structuring the recording? Dara Tucker (DT): The songs for this album stemmed from the loss of both my parents in 2014. I coped with that overwhelming loss by using songwriting as therapy. The rain can be both destructive and cleansing, and I wanted to create a project that reflected that. There are two tracks entitled “Oklahoma Rain” – each one embodying a different expression of rain’s effect on our lives. Columbus first got a chance to see you perform this spring, with the Charlie Hunter Trio. How was that experience? DT: The show with Charlie at Natalie’s was maybe the 3rd show of the tour. We had gotten the chance to work out some of the kinks the first two nights, and I just remember all the elements coming together when we got to Columbus. I was feeling more confident, and we gelled better as a band than we had before. Charlie is an ‘in the moment’ kind of guy who doesn’t really like to overthink things. He gives you a chance to find your footing, and make the mistakes you need to make until things start to crystallize creatively. I think he enjoys that space where you don’t really know what’s going to happen on stage. The unpredictability of it all is a real draw for him. I definitely learned to appreciate this approach more when I was on the road with him. I’m looking forward to more dates with him later this year, as well as having him produce my upcoming project. How have audiences reacted to Oklahoma Rain so far? DT: I think my audience has broadened a bit with the release of Oklahoma Rain. I tend to shift from doing a pretty straightforward jazz album, to doing something that represents a more eclectic concept. Since my last album The Sun Season was geared towards a jazz audience, I was ready to branch out a bit and try something that allowed me to spread my wings, creatively. Fans of R&B & singer-songwriter music, and even some Americana fans have reached out to me to let me know they’re enjoying this project. If you’re like I am, and love music that runs the gamut, it’s a rewarding listen because your ears never get bored with one sound. Tell us about the members of your touring band. What excites you about playing with them? DT: Demarco Johnson will be on keys, Greg Bryant will be on bass & Marcus Finnie will be on drums. Fortunately, living in ‘Music City’ allows me to pull from a pretty vast well of musicians for local gigs, and for our touring band. The great thing about these guys, besides their stellar musicianship, is that you really won’t find a kinder group of folks, in or out of the music business. That’s one of the most important things to look for when taking a band on the road – are they kind? Do they get along? Are they fun traveling companions? They are all like family to me, and I relish the opportunity to perform with them. Do you have any plans for new projects after your tour? DT: I will start production on the new album in October. As I said earlier, Charlie Hunter will be producing this project. With him being such an “In the moment” person musically, I have no idea where we’ll end up going with this one. That’s kind of exciting on some level – nerve wracking on another level. I’m having to exercise my ‘trust bone’ like never before. I got used to being in the driver’s seat with Oklahoma Rain. It really was my brainchild. But I’m excited to hear what Charlie’s concept will be for my songs. We’re still in the ‘discovery’ phase, so to speak. Still deciding on material and personnel, etc. So, it’s all unfolding before my eyes. Do you have any advice for young students thinking about getting into singing or songwriting? DT: Listen to the masters. Study your history. Find out who the great songwriters were and learn from them. Study great singers, and learn why they’re great. I think it’s great that singing is something almost anyone can do, but the world needs more singers that are devoted to their craft. Study with someone if you need to, but never stop learning. Do you have anything else to share for Columbus jazz fans thinking about checking out your show? DT: I’m looking forward to presenting some tracks from the Oklahoma Rain album, as well as several new songs for future projects. Songwriting is my favorite thing. I’m always excited to premiere new material for appreciate audiences. It’s very cool to play venues that attract real music lovers who are attentive, and open to new musical experiences. That’s where I thrive. I’m looking forward to creating some great memories with you all.